Porsche says the Panamera S hybrid is the company's most fuel-efficient car ever. Porsche will unveil a hybrid version of the Panamera next month at the Geneva auto show. The Panamera S hybrid uses the same driveline offered in the Cayenne hybrid and its sister model, the Volkswagen Touareg hybrid. The system is mated to a 333-hp supercharged 3.0-liter V-6 gasoline engine. European sales of the Panamera S Hybrid start in June, priced at 106,185 euros in Germany, 10,000 euros more than the standard Panamera S. North American sales begin later this year. The Panamera S hybrid is capable of running on either electric propulsion alone, for short distances, or a combination of gasoline-and-electric power. In pure electric mode, Porsche says the sedan has a range of up to 2km (1.2 miles) at speeds up to 85kph (53 mph). 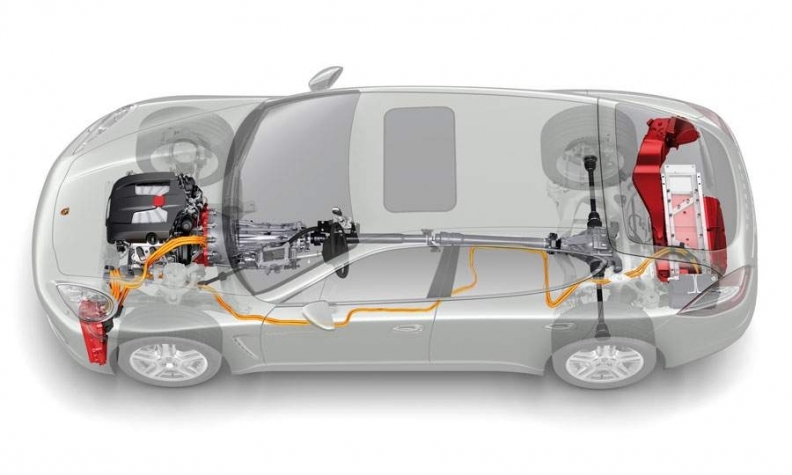 Electric energy created during braking and coasting is the only source of charge for the battery, although Porsche is believed to be working on a plug-in application that would bring a longer range and the likelihood of a more powerful lithium-ion battery. The Porsche Panamera S hybrid uses an Audi-sourced V-6 that is connected to a 47-hp brushless electric motor. The nickel-metal-hydride batteries are mounted below the trunk floor. Porsche says the Panamera S hybrid accelerates to 100 kph in 6 seconds and has a top speed of 270kph (168 mph). Combined-cycle fuel consumption with the optional Michelin low-rolling-resistance tires is put at 6.8 liters per 100km (34.6 U.S. mpg) on the European cycle. 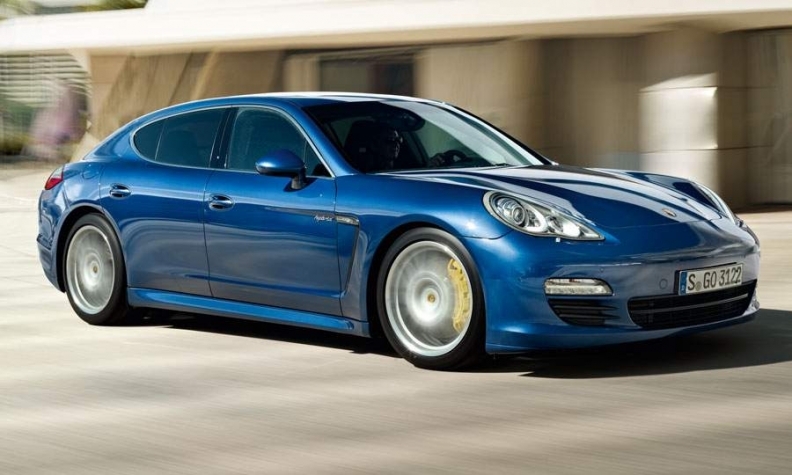 That figure makes the Panamera S hybrid the most fuel-efficient Porsche ever produced. The Audi-sourced V-6 is combined with a 47-hp brushless electric motor mounted within the gearbox housing. It also serves as the starter motor and generator. Together, the Panamera S hybrid's gasoline engine and electric motor combined achieve 380 hp. The rear-drive vehicle uses an eight-speed automatic transmission, the same used in the Cayenne. Electrical energy for the electric motor is provided by a nickel-metal-hydride battery mounted in the floor of the trunk.